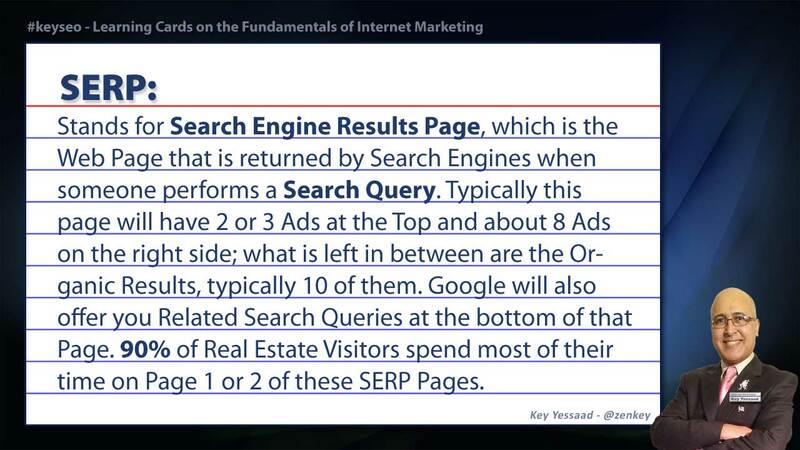 Real Estate SEO and Internet Marketing Trainings | Internet Visibility is Marketing and must create Influence! Internet Visibility is Marketing and must create Influence! In the past 3 weeks I have been adding a Glossary Term Definition a Day focusing on Real Estate SEO Terms and Internet Marketing Lingo. This project started in my Real Estate Training Classes and I noticed that many of the Terms of Search Engine Optimization and Marketing were either murky to some, or downright confusing. I have so far uploaded 25 Info-graphics and plan to continue adding one a day in the month of December. The focus is primarily on Real Estate Industry and its relationship to Internet Marketing, Lead Generation, Web Services, Internet Ranking, Search Engines, SEO, and Social Media. This is an ongoing project and this Glossary Page will continue grow on a weekly basis – You may even make requests or ask questions. On October 29th in Orlando, Florida, Key Yessaad will be presenting a brand new training entitled Direct Response Prospecting for the Internet Savvy Real Estate Professional. This training illuminates ways to leverage an effective and thoughtful internet strategy for generating listings and, once generated, keeping that pipeline full. With proper systems in place, you can maintain a constant inventory which, in turn, attracts buyers and also helps attract more listings. This all-day workshop is designed for agents who have a commitment to internet prospecting, and who are familiar with some of the available tools online. 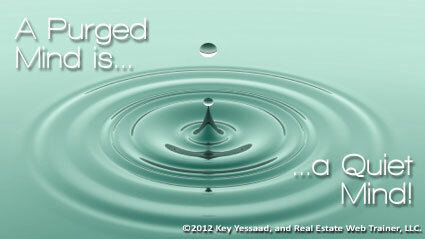 Direct Response Prospecting is driven by integration and is an area that very few agents have mastered. For those who dedicate themselves to consistent habits in their work, there are a world of opportunities available through Direct Prospecting and Key will be introducing you to these channels through a variety of topics. Social Media Prospecting Postings, and Video Blogs. A handout covering these topics will be provided, and you will also receive a code to access additional online materials designed to help you master these principles. Please note: This is NOT a webinar or sales event. There will be no items for purchase or additional training days needed: This event is an all-inclusive program! Your ticket includes a full day of training, lunch, and all of the additional materials you will need to apply the Direct Prospecting principles. In fact, Key Yessaad’s training is backed by a money back guarantee. If you don’t take away at least 3 or 4 valuable ideas for your business from this training, we will give you a full refund. If you have not had the pleasure of meeting Key Yessaad, here is a quick introduction to his work. An internet strategist, SEO expert, and co-trainer with the Live Interactive i-FAStTRAC program, Key has been involved with the real estate field for over 10 years. Having worked as a CFO and trainer for a real estate office with over 100 agents, Key has gained insights into the workings of a real estate career. With that knowledge, he has created a series of training seminars to help empower real estate professionals to leverage the internet to grow their business. He has worked with hundreds of agents over the years and seen them succeed with his strategies. In fact, you can view some recent testimonials of successful and productive agents on Key’s website, www.RealEstateWebTrainer.com. The October 29th workshop will be held from 9:00am to 5:00pm at the Sihle Insurance training facility located at 1021 Douglas Avenue in Altamonte Springs, Florida. Participants should arrive early as seating is first come, first served basis. Feel free to bring your laptop or tablet as well as any note-taking essentials. Tickets are available for the event and there are a few options for you to consider. Regular price for the event is $199 and tickets can be purchased the day of the event at the door. However, if you like to plan ahead, our sponsors have arranged a significant discount. The first 45 tickets are only $79. If you purchase multiple tickets at the same time, you can purchase 2 tickets for $145, and 3 tickets for $199. The first 45 tickets are non-refundable, but they may be transferred to another agent by speaking to our program director, Allison Pruiett. Tickets purchased at the full event price may be refunded up to one week before the workshop. The event is limited to 80 participants, so there is no guarantee that we will have space available on the day of the training. This week, I have discussed a variety of topics in my blogs. Basically, what I would like to reiterate today is this: knowledge is key. What do I mean? First off, knowing your real estate market is crucial to your success. If your knowledge is stale, so is your business. Something as simple as taking the long way home can help inform you about the local market and give you an edge in the business. Knowledge about the workings of the internet is also a major player in your success. Real estate is all about internet presence! By improving your marketing bio, you can attract potential clients. Trust me, your clients will Google you to validate you, even before you meet. Your internet marketing bio should go beyond social media. How can you have a good bio? This is one of the topics I discussed in my trainings this week. If you are determined to improve your real estate business this year, I would encourage you to get into a training. By understanding the interet and how it works, you can have the tools to create a business beyond your expectations. So, as we move into February, think about the value of knowledge in what you do. Making an investment of your time and effort will pay for itself in the long run. 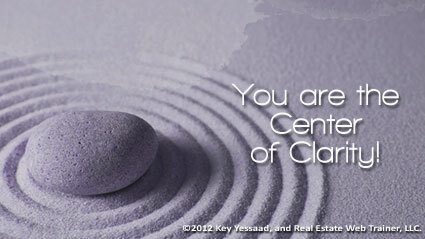 Happy February to all of you- may 2013 be the year of your dreams! SEO Training Session 6 – What do Web Spiders feed on? I am one of many Real Estate Trainers who coach agents on growing their Real Estate Business; but I come at it from a different angle; I am an Internet Marketing Strategist with degrees in Mathematics and Programming meshed with the experience of running a large cluster of Real Estate Offices. Marketing is job one for Real Estate Professionals, but many of them are struggling with how to leverage the power of the Internet, SEO, Social Media, Blogging, Internet Marketing, Lead Generation, and Prospecting for new business. My experience in building thousand of websites, and trainings illuminate all of these ideas – but what makes my seminars powerful are the homework and plan of actions I have devised for the participating agents. Ask me a question if you are interested in hiring me to speak to your agents, train them, or hold special Webinars for your office – you will love the way I empower Real Estate Professionals, and I always produce results! (910) 538-6610. This week, we discussed a very important topic: Planning. Planning is a multi-faceted concept that requires a daily commitment. To run a successful business, one must plan in several phases. First, you need to know your goals for the year. This allows you to plan your monthly, weekly and daily activities. By planning your time, you take control of and responsibility for your actions and give opportunity a chance to sneak in. In other words, a good plan creates opportunities. Planning also helps take the emotion out of the necessary activities. 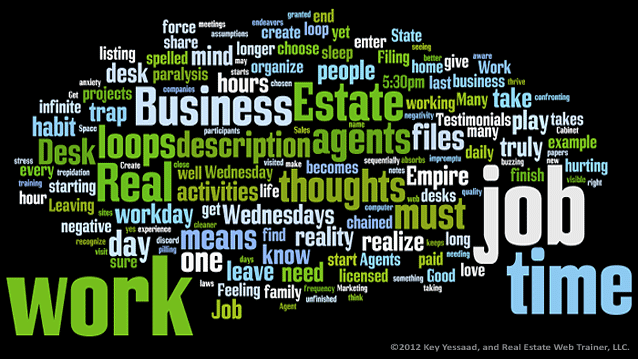 Let’s face it- there are many tasks you may not like that are involved in the real estate business. It is up to you to tackle them anyway- if you want to succeed! How you feel is important, but it should not be the gauge by which you perform. You must take on the idea that no matter how you feel, you will “do it anyway.” As the new year marches on, I want to challenge you to plan. Sit down each week and make a plan for yourself for the coming week. You will be amazed at how taking this small step can affect your productivity and your success. And remember, make the commitment to “do it anyway,” even on the tough days. With a good dose of perseverence and planning, 2013 can be YOUR year! January is halfway over… How are your business resolutions doing? Are you performing productive, daily activities that will help you reach your goals? If not, get with it! Time flies by, even when you’re working hard, and it will be 2014 before we blink. Today, recommit yourself to your goals and your business. I want to see all of you reach your goals this year. This past week, I covered a variety of ideas. The main idea I want to express is the importance of becoming pro-active toward your vision of your success. First, this involves creating your vision and setting your course. Knowing what you want allows you to break down your grand vision into daily, do-able activities. This is important because it keeps you from feeling overwhelmed and defeated. Second, become pro-active, not reactive. Set the course for your day: wake up early and be mentally prepared for the tasks at hand. If you are 20 or 30 minutes ahead of your day, this allows for planning of those daily activities that lead to achieving your grand vision. So, today, forgive yourself for your mistakes so far, and make a commitment to plan for tomorrow. Let’s all have a successful 2013! How is your year going so far? Are you creating good habits that will ensure your future success? If not, then perhaps it’s time to get started! This week, I covered several topics, all with some focus on motivation. In a nutshell, motivation and good habits are the keys to your success in your business. Your personal motivation will dictate your actions, affecting whether or not you meet your goals. If you are motivated to complete tasks within your plan of action, you create good habits and ultimately ensure your sucess. Also, understanding the motivations of your clients allows you to set realistic goals with and for them. Neglecting to know the “why” of your customer, you set them,as well as yourself, up for failure. Finally, you must empower yourself to never quit. Determination is key in this business where “No” is a commonality. By committing to the success of yourself and others, you are guaranteed to make 2013 the year of your dreams. Happy New Year to all of you! I am excited to get 2013 started and I hope all of you are as well. This year can be YOUR year, you just have to set your focus and make it happen. That sounds like a big responsibility, doesn’t it? That’s because it is! Creating a successful Real Estate business is a HUGE responsibility, but I am doing my best to guide you on your journey. So, without further adieu, let’s get started. This past week, I presented you with a new 30-day Challenge for January: Read ACTIVELY for 20 minutes per day. It may be difficult at first, but I promise you something good will result. Performing tasks methodically and thoughtfully can often result in renewed creativity, or even a new approach to solving a problem as I mentioned in yesterday’s blog. So, don’t procrastinate- start good habits now for a rewarding and prosperous 2013! I hope all of you had a wonderful Christmas holiday with friends and family. December is almost over- how are you doing with the 30-day Challenge? Are your goals for the new year set? Is your mind in the mode of work and dedication? Have you prepared yourself to achieve your dreams in 2013? I certainly hope so. With the new year only a few days away, I wanted to focus my blogs on motivation and positive mindset this past week. The principles I’ve covered are at the core of your success. Optimism and an inner state of calm can be positive forces on your negotiations and can also be effective when establishing relationships with clients. How can you foster a positive energy in yourself? First, know your goals and experiment with ways to reach them. You may fail several times, but many failures can lead to success. There is nothing more satisfying than to know you are trying. Next, regular reflection of your experimentation can provide constructive criticism for your future. Knowing what you have done in the past and learning from those mistakes and successes will help you plan your business. Finally, keep your sense of humor. Laughter provides a mental break from the challenges of life, and actually releases hormones that are great for your body. So, be funny and appreciate those who can foster a good laugh. Nothing is more uplifting for yourself and others than a hearty, authentic chuckle. With 2013 only a few days away, let’s make a commitment to approach 2013 with good spirits and minds that are ready for success. Happy New Year to all of you, and good luck! As we approach a new year, there are many aspects to think about involving your success in your business. This week, I have covered various topics, but the underlying theme comes down to COMMITMENT. 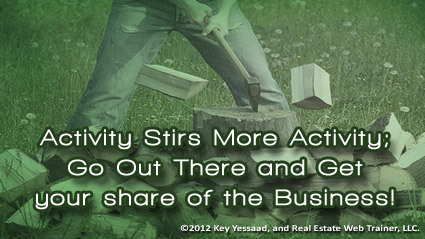 Your real estate business will not succeed for you unless you commit to it. Success can only be yours through perseverence: There is no shortcut, no easy road. Perseverence means prospecting even when you face rejection, applying principles effectively, taking responsibility for your expenses, and, above all, building your business not on your ego, but on a vision. Real estate is not for the faint of heart, and only those who are willing to make a commitment of time and energy, even when the going gets tough, will become successful. Keep these things in mind as you face 2013. Do you want a successful real estate business? Are you willing to make the COMMITMENT? Search yourself and be honest. Your success depends on you! If you would like to read more of my blogs, here is a breakdown of the categories I cover. Feel free to browse. It is almost the middle of December and I have been blogging about ideas to help you have a more successful 2013. This week, I covered several topics from balance, to motivation. But I think these two ideas are intertwined. If you can strategically balance your sources of business income, motivation is easier because you know what you need to do. Nothing makes life easier than having concrete tasks for your to-do list. So, take a visual inventory every day of your listings and buyer prospects, make the effort to tour the newest listings in your market, and your knowledge will not only benefit, but so will your business. NFC or Near Field Communication – What is That? This first week of December, I have been discussing with you some important ideas involved in the 30-day Challenge. Personal Management and Planning are two key components to becoming an effective Real Estate Agent. If you cannot take responsibility for how you spend your time today, your future will not produce the results you desire. Taking responsibility involves performing daily Activities that will forward your plan, as well as not allowing yourself to get caught up in Crisis Management. Real Estate is a tough business, so don’t beat yourself up for not being perfect- these skills take time to develop. That’s why this is called a Challenge! We have 3 more weeks to go, so don’t give up yet. Start working towards effectiveness, and 2013 will have wonderful things in store for your business. If you’d like to read more of my blogs, here are the categories I write about on a regular basis. These are the last ten days recap of my blog posts focused on the Real Estate Industry, with a focus on the thinking of Preparation and Planning for Real Estate Professionals. The main ideas boil down to a central theme of Passive and Reactive Business Engagement, versus the Driven and Planned Business Day. Real Estate Agents cannot truly plan their days until they allow their mind to be purged of broken agreements, forgotten commitments, and the continued feeling of being continuously a step behind their to-do list. These posts were written from August 25th through September 3rd 2012. Contact: Emma Ahearn Real Estate Training Institute, Inc. The main ideas I shared in my posts in the past week focused on the relationship Real Estate Agents have with Time Management, Negative loops, the power of a clean desk, and how sometimes paralysis in Business can be caused by one’s lack of understanding towards one’s job. One of my continuing central themes is that many Real Estate Brokerages function without a proper Business Plan, while the successful growing ones have the right scaffolding of growth and prosperity. In the last 7 days my Thoughts of the Day blog posts focused on the relationship Real Estate Agents and Brokers have with managing their time. Of course the concept of managing one’s time is fraught with pitiful if one does not have a clear Business Plan grounded with a proper Activity Plan. 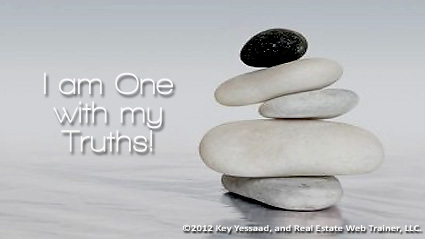 To train, inspire, and coach Real Estate Professionals succeed is my passion. I specialize in Internet Marketing with and emphasis on Google Visibility. My Trainings and Internet Strategies intersect with powerful ideas and Plans of Actions that produce results.